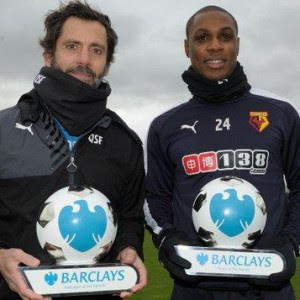 Super Eagles and Watford striker, Odion Ighalo and his manager Quique Sanchez Flores have been named player and manager for the ‎month of December 2015 in the Premier League. The Nigerian striker won the award in a keenly contested race ahead of Arsenal’s Mesut Ozil, Everton striker Romelu Lukaku, Nigerian born Tottenham midfielder Dele Alli, Stoke City’s Austrian forward Marko Arnautovic and Leicester City playmaker Riyad Mahrez. Ighalo scored six goals in five premier league matches in December netting in all the games as Watford secured 10 points out of the maximum 15 points available including impressive wins against Liverpool, Sunderland and Norwich City.